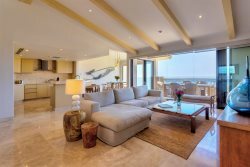 Set amidst the oceanside hills to the immediate west of Cabo San Lucas and surrounded by a Jack Nicklaus Signature Los Cabos golf resort, the luxury community of Copala at Quivira Los Cabos is home to our two new condominium properties. Consisting of a mix of condominium towers and private residences, and neighboring the beautiful Pueblo Bonito oceanfront resort, Copala offers amenities catering to every taste. From the community Club House featuring an infinity pool, spa, fitness room, movie theatre, and private event space, to gourmet restaurants and a full-service concierge, to trophy fishing and miles of stunning beaches and Cabo golf resorts, everyone in your party can find their perfect vacation escape at Copala. Copala’s crown jewel, of course, is the Quivira Golf Club. Voted the 2014 Best New International Golf Course by Golf Magazine, and one of Golf Digest’s Top 100 courses in the world, this championship-length masterpiece was designed by The Golden Bear himself. With ocean views from every hole, and a few stunning layouts where errant shots can land in the Pacific, Quivira has found its way onto golfers’ bucket lists the world over. But, only guests and residents of Copala and its affiliated properties can tee up at this Los Cabos golf resort, which makes playing there one of the most attractive benefits of a stay at our Copala condominiums. It’s not just the on-property amenities that make Copala special. Our Los Cabos golf resort properties are located a short drive from the myriad attractions of Cabo San Lucas and San Jose del Cabo, from art galleries to fine dining. On-water activities also abound, including surfing, snorkeling and more, all easily arranged through the Copala concierge. And, for our golfing guests looking for a Cabo golf resort, world-class courses dot the Los Cabos peninsula, including Jack Nicklaus’s first local design, the legendary Ocean Course at Cabo del Sol. Our two new Copala condominium properties include Copala #2104 and Copala #3502. To stay and play at one of our luxury Copala condominium properties, contact us today.